It’s Memorial Day Weekend, and for many of us that means an extra day off, time spent with friends and family, barbeques and maybe a few beers over the long weekend. Stores will hold “Memorial Day” sales, and the roads to beaches everywhere will be clogged as we head into the long-awaited summer season. Lest we forget, though, Memorial Day is about the sacrifice made by the more than 1.3 Americans who have died in the wars of our country. This is the day set aside to remember the men and women throughout United States history who have given their lives in military service so that all of us are free to realize the American ideals that we treasure – and often take for granted – life, liberty, the pursuit of happiness. Freedom to say what we want to when and how we want to say it. Freedom to practice whatever religion we choose – or none at all. Freedom to speak out against and stand up to injustices. Memorial Day was born from our country’s darkest days. 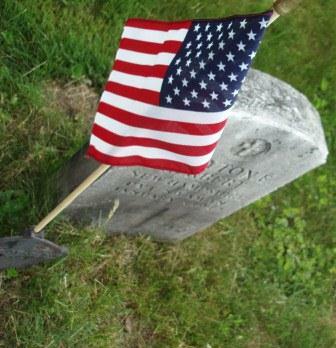 Many communities during the Civil War observed a “Decoration Day,” placing flowers on the graves of the war dead. More Americans – 625,000 – died in that war than in any other, accounting for nearly half of U.S. war fatalities in our country’s history. The first Memorial Day was proclaimed in May 1868 to honor those who died during the Civil War, with flowers placed on the graves of Union and Confederate soldiers in Arlington National Cemetery. After World War I Memorial Day evolved to commemorate Americans who have died fighting in each of the country’s wars. It was not until 1971, more than a century after the end of the Civil War and as the United States was reeling from the casualties and social strife of Vietnam, that Memorial Day was officially made a national holiday. This weekend, flags will be lowered to half-staff. Some towns will hold parades with color guards and marching bands. American flags will be placed at the graves of soldiers all around our country, and flowers will appear on the graves of many, both soldier and civilian, as families and friends remember loved ones. Military outfits and veterans groups will hold ceremonies to honor their fallen comrades – those from recent conflicts in Iraq and Afghanistan, the loss still a fresh scar of pain, as well as the war dead of past generations, reaching to the earliest days of our country. It is the current members of the military and the veterans who have served before, of course, who fully understand the meaning of Memorial Day, of the sacrifice made for freedom. The veterans have returned from wars, but they leave much on the battlefield or in the war zone, and often they lose friends there. For those who have served and continue to serve, and those who have lost a friend or brother, a son or daughter or spouse, Memorial Day has real meaning. As for the rest of us, whether we are at the beach, grilling out with friends, shopping, or just relaxing one extra day this weekend – may we pause to remember, to give thanks, and to hope for the day when there are no new names to add to our war memorials. The merit of changing life’s pace hit me several summers ago, when I spent a few afternoons each week working as a docent at The Frost Place in Franconia. I’ve always enjoyed stopping to smell the roses – both figuratively and literally – but I had recently entered into a new stage of my life, one that involved two babies and plenty of hectic. Five months earlier, I had become the mother of twins. After several years as a small-town newspaper reporter, with a finger on the pulse of the local communities and a schedule as unpredictable as the news, I was immersed in a new reality of relatively sleepless nights and baby talk, dirty diapers and midnight feedings, caring for two little beings when I’d only really ever had to take care of myself. I’d started doing a little writing from home, but getting out of the house – by myself – was emancipating. Some days at the farmhouse just down the road and around the bend, where the poet Robert Frost lived nearly 100 years ago, were busy with visitors. Others were quiet, and I would be left alone with poems to read and a couple acres of semi-tamed field and forest and garden to explore. I began noticing wildflowers I’d maybe seen before but never really looked at closely, finding monarch caterpillars munching leaves in a thick stand of milkweed (and, later, their chrysalises, then emerging butterflies), trying to identify the array of birdsong floating through the air and creating its own form of poetry. One of the books in our small shop in Frost’s former barn – the National Audubon Society’s Field Guide to New England – became my go-to source for information on my new discoveries. At summer’s end, the Dartmouth College intern with whom I had shared docent duties presented the book to me as a parting gift. The two children who were babies that summer are now 5-year-olds and have a little sister. We look at the book together often, revisiting familiar information and searching its pages to find the new plants and animals we’ve seen or heard. It’s fitting that the book came from a place where Frost lived, as the poet reportedly loved wandering through the local landscape, botanizing all the way. Life certainly hasn’t become any less hectic since that summer at The Frost Place, with a growing work load of writing projects and three active kids. But as much as life becomes busier with children, it also grows more inquisitive. “Why?” and “How?” are favorite questions, asked endlessly, and we alter the pace of our lives to allow for discovery. We wander through the fields and forests around our house often, in all kinds of weather, in every season. Moving at a child’s pace, I notice more than I would if I were running or cross-country skiing or biking solo. 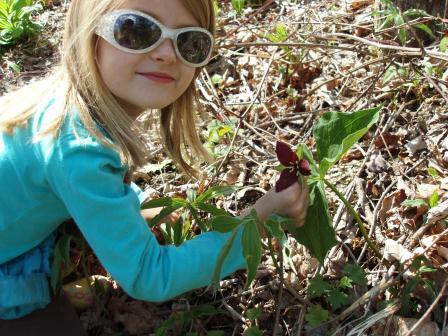 Looking at the landscape from a child’s perspective becomes a learning experience for all of us. As we slow down we discover endless wonderful things: the petals of trout lilies curl backwards toward the sunlight, the white springtime blossoms of wood anemones are tinted pink on their backsides, the flowers of the small purple violets growing wild in the woods are shaped like butterflies. In the spring we listen for the peepers calling from the nearby pond and creep as quietly as we can to the water’s edge; it is never quietly enough to catch one of the tiny frogs in the act of singing. In summer we watch the lupine plants grow higher each week until they burst in purple spikes that fill the back field, and we know where the best stashes of wild blackberries are. In fall, we look for signs of bear along the trail that meanders through the old apple orchard. The tracks through new snow in winter tell us which animals have passed by recently, and we can tell where the red squirrels like to eat by the deep piles of pinecone scales beneath tall trees. We still get caught up in the craziness of school and meetings, t-ball and swimming lessons, paying the bills and buying the groceries and tending to the endless piles of laundry. But we take the time, especially when things get crazy, to change pace. Change is good, so the saying goes; variety is the spice of life. A version of this essay appears in this week’s Record-Littleton.